A few time lapse video tests with our GoPro HD Hero2. Enjoy! When you’re the only game in town people know to call you. But when you offer a service that many others offer (such as video production) it can sometimes feel pointless to add yourself to the infinite number of online listing opportunities or service finder directories. Over the past year as Miceli Productions has grown and focused on SEO (search engine optimization) efforts, we’ve made it a point to be listed anywhere we can. Some services stand out more than others. ThumbTack.com is a way to find and book trustworthy local services. The website offers matchmaking/concierge type features for free to its members. We use it and we’d like to suggest it to you as well. CLICK HERE for Miceli Productions’ comprehensive listing on Thumbtack.com, complete with Q & A about what you should know before hiring a video professional. Depending on the size of a project, we often work with other artistic professionals and we’d like for you to meet them. So we asked our make-up artist Jess a few questions. She’s got a “real” day-job, but she loves the artistry of face-paint. 1) What’s your professional and educational background? “I started playing around with make-up color at a very young age. When I was child all of my Barbies and Dolls were covered in make-up and nail polish. When I became old enough to wear make-up I became obsessed with it! I was always asking my friends if I could do their make-up or give them make-overs starting at age 14. Of course, at that age it was wasn’t something I took seriously but I seemed to have a knack for it. I went away to college and continued to do make-up for my roommates and friends while obtaining degrees in communication and business with a minor in public relations. I have been working in the Insurance Industry for over 10 years now and a few years ago I found myself really missing the excitement of giving someone a makeover. I missed being able to make someone feel good about themselves just by applying make-up. My friends were still coming to me for tips on skin care and make-up application so I decided to take a second job selling Mary Kay Cosmetics and Skin Care. 2) How did you get into make-up consulting? And why? 3) You seem to really like the artistry. Would you consider this an art form? 4) What have been your two favorite clients? “Right away a bride I did make-up for named Amy comes to mind. I started working with Amy about 8 months prior to her big day and Amy had adult acne. Amy was tomboy who admitted she knew nothing about make-up. She was really concerned about covering up her acne for her wedding day. I suggested we try treating her acne instead of covering it up. Amy was very skeptical that her acne could be successfully treated. We tried several different skin care regimes until we found one that worked for her and after about 3 months her acne was mostly gone. When her wedding day came around her skin looked flawless and we were able to focus on using make-up to bring out her eyes rather than cover up her acne. Amy went from being so self-conscious and not wanting her picture taken to loving her skin and being photographed. She has been married for over a year now and still contacts me regularly for advice on her skin and make-up. 5) What’s your favorite product/tool and why? 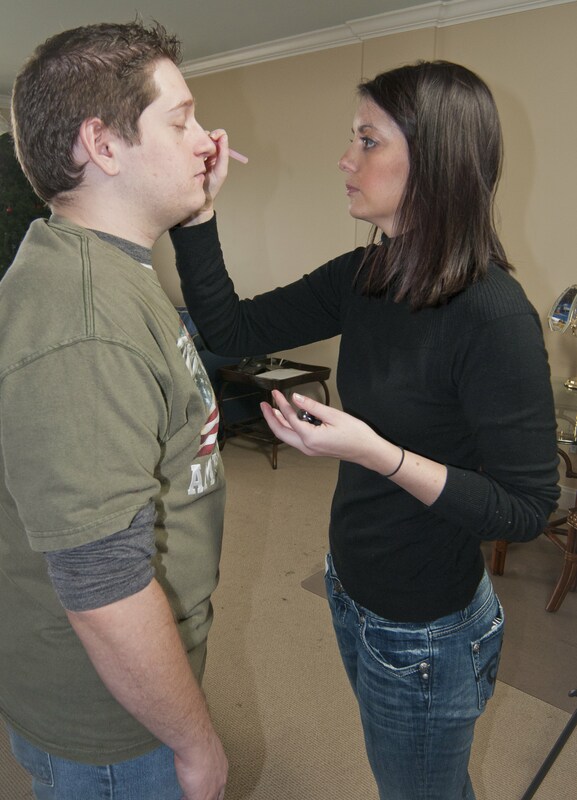 6) Give us the one tip you’d like everyone to know… For general everyday makeup or for film makeup…. Thanks for talking with us Jess! CLICK HERE if you’d like to contact Jess for her professional make-up expertise or to check out her professional Mary Kay Cosmetics page. A first look at some of the footage for Shane Michael Taylor‘s debut music video WARRIOR COWBOY. Day 1 of shooting we covered three scenes involving only Shane, two of which are in this video. We continued principal photography mid-January with additional cast and crew. By the time we wrap filming, we will have shot in 6 locations, including Mary Our Queen Church, Waterbury Hospital and Waterbury Train Station. The video is actually a short film involving two brothers. Shane, the younger brother, has cerebral palsy. And John, the older brother, has taken care of Shane for most of his life, acting as protector and provider, especially since the loss of their mother many years ago. The brothers are grown now, and John feels he needs to follow his desire to enter the Army, forcing Shane to deal with feelings of abandonment and solitude. Keep watching for more behind the scenes footage and sneak peaks as editing and post-production continue. and to listen to the song CLICK HERE. Another great filming location we visited was the West Haven Shoreline along Beach Street. Great dunes and sand, a pier and seagulls hanging out even in the winter! The late day view of Long Island Sound was beautiful and we found several great backgrounds to work with visually. We got a little sidetracked and started taking beauty shots of the beach. But since we could all use a reminder of summer fun in wintertime, here they are. Look for Shane Michael Taylor‘s upcoming music video “Warrior Cowboy” to see how we incorporated sand backgrounds with green screen use.